I should start by saying that this is not "the right way" to do it, but I'm describing two of the many possible ways to do it. This description is for Marlin. If you are using Repetier on your printer, you may pick up some advice but the specifics will be different. My biggest annoyance with the typical LCD's used in these controllers is that if you're not standing directly in front of it, you can't really read the display. OLED displays use less energy than traditional LCD displays. They're easily viewed from any angle and have a fantastic contrast. I settled on one from wide.hk that has the required 20 (wide) x 4 (height) character displays. These are less than 4mm (1/64 inch) thick and has good mounting holes. Cost $34. The SD card reader was something I had picked up from DX a long time ago A straight SD reader based on SPI. 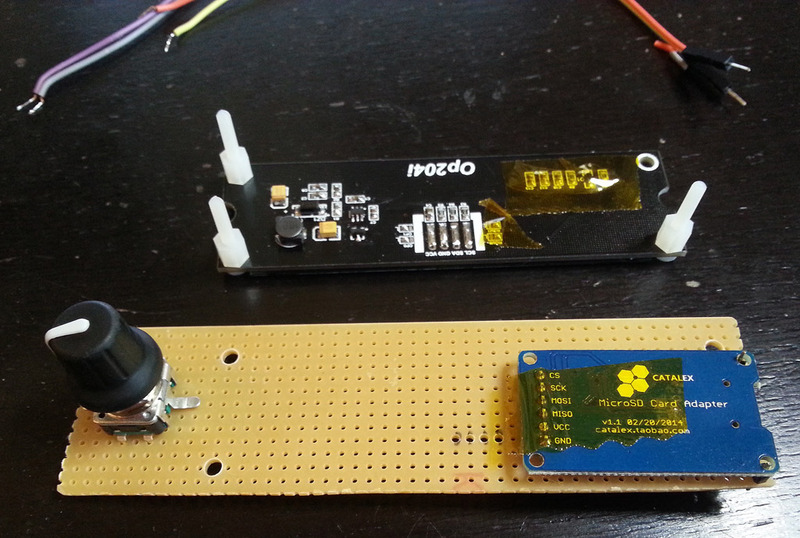 I got the encoder from Adafruit and I found a standard buzzer that was fairly small in a drawer. Pretty much any screen, SD reader, encoder and buzzer can be used. Next is the fun part of figuring out how your controller should look! Grab your components and try to lay them out as smart as possible. Next you'll need a way to connect them together. A standard perfboard cut to 125 x 35 mm (48 x 13 holes) is what I needed. Your needs will probably be different, but using perfboard makes it easier to lay things out and solder it once you know how you want stuff. 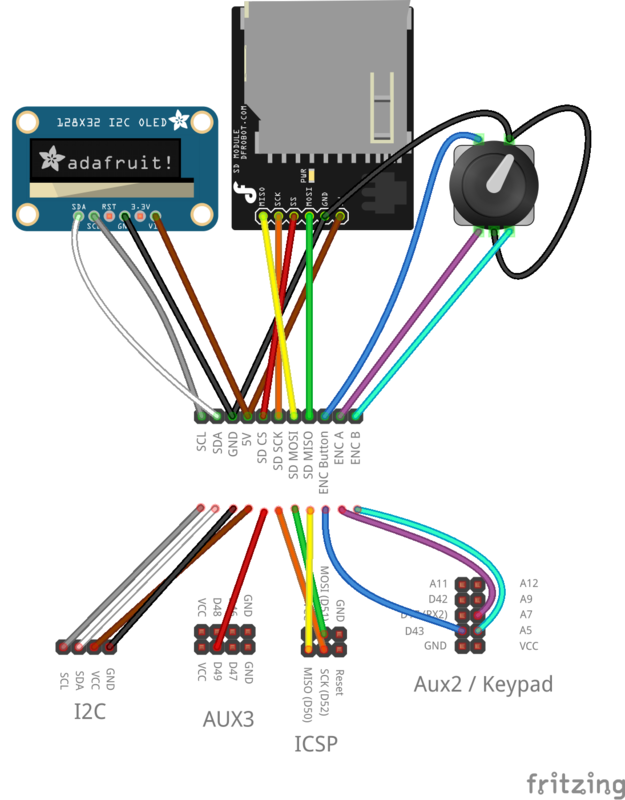 Another alternative is to design your own professional PCB using software like Fritzing. 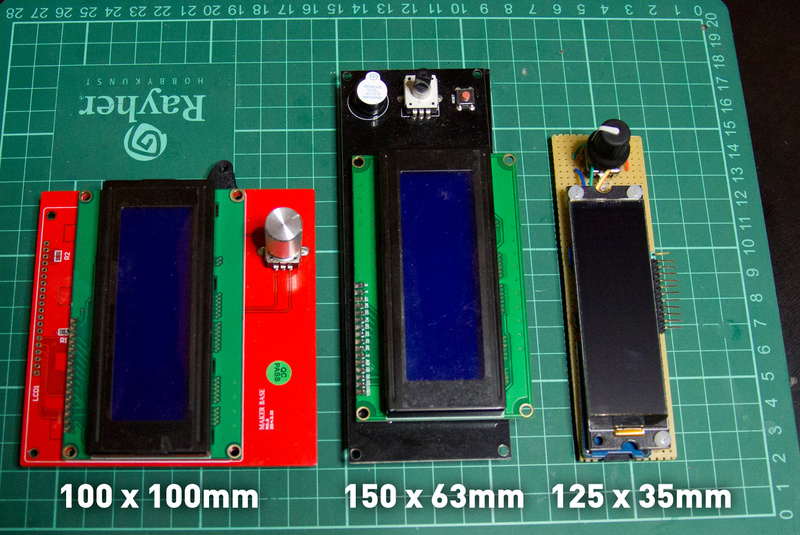 It would be a good first project, but it takes time to get the PCB produced. You can also add indicator LED's and other custom components if you want to, but these will require you to add more custom code. I have a somewhat varied programming background, but C++ isn't exactly my native tongue. That's also my reason for doing projects like this - to learn more. I find the Marlin codebase a bit confusing. The root file is Marlin_main.cpp. The Arduino IDE will make a copy with .ino extension of this file when you start up the Arduino IDE. At the top of this file is a load of #include statements. These are mostly files full of #define statements that are replaced by the compiler every time you hit "compile", but they also contain methods that will reside in a "global/root" namespace. Take the fairly central file "stepper.h". This is the header file for "stepper.cpp" that controls how the printer moves. None of the methods here belong to a class. They're just "there". Coming from an object oriented programming background, I didn't expect this. I guess there's things/limitations such as dependency on interrupts that can force certain ways of doing things? As far as I know, the first control panel for Marlin was added by fellow Ultimaker owner Bernhard Kubicek (thanks Bernhard!). After this, many others have hacked in support for their own panels. Over time, the codebase, and especially the config files, have become a little messy so it can be kind of hard to navigate. More or less any screen can be used, but it will require some modifications to the Marlin codebase. The first you'll need is a small library that can print characters to your screen. Most screens will have standard functionality for this, so if you're lucky you won't need to write more than a little wrapper-code. In my case I received a barely functioning code snippet, so I had to do a little more work. You can find a ZIP-file with my Marlin implementation here. This means that the OLedI2C-class inherits all the functions in the print-class (Print.h) and expands on this. Without inheriting these methods, you'd have to write 18 functions to handle printing of all data types (uint8,uint16,char, bool, double and so on). The OLedI2C-class also "overwrites" the write-method. It changes the default behaviour of the Print-class to instead print to the screen we're implementing. There's also two "special" commands in the list above. One creates custom characters (createChar) and the other prints it (printChar). These allows us the output graphical symbols for folder navigation, temperature, time and more. A standard "Character LCD" will typically have up to 8 slots for creating such symbols. If you're using a "Graphical LCD", you can create all the characters you want as long as you have the memory required. My implementation also has other methods, but you may not need these. When you have a well working screen-class it's time to make the actual implementation that Marlin will use. You set this up as shown below. pins.h - all I did here was to change the SDSS pin for my Megatronics 2.0 hardware (board type 701). Other than that I've kept all the default pins as defined. If you're using Ramps or something else, you'll need to look up what pins to use in the online documentation. The OLED_SSD1311 define is my main switch. If this is defined, it'll include the things below. The ULTIPANEL enables encoder support. This is one of the more messier things in the codebase. This also enables other things but it does not cause problems for me. It would however be great if there was a generic define that just enabled just the Encoder and not other things related to SD card, menus & Ultimaker specific features. NEWPANEL enables lots of LCD-related features, but is also used for Encoder-specific features. SDSUPPORT is really the only include that does exactly as it's name says. Width/height is used for menu scrolling and the I2C address is just there as it's "convenient to have". In my case I could just as well hardcode it in the class as all the screens of this type use the same address. 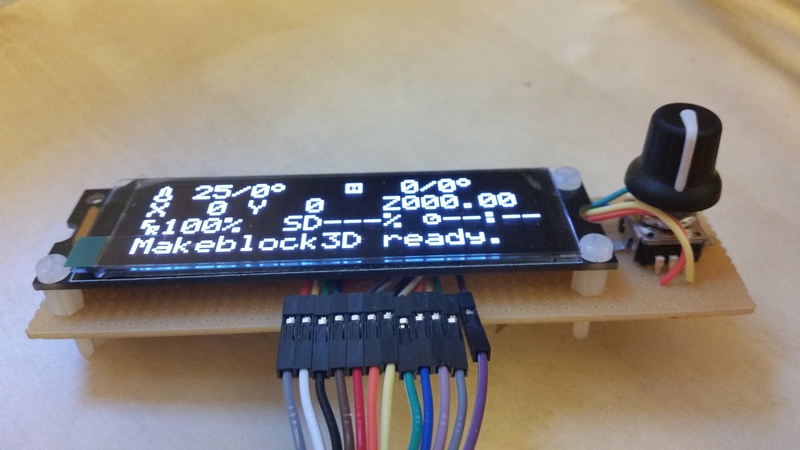 OLedI2C.h & OLedI2C.cpp - header and implementation of the custom OLED character display. You can also use a non-character display, as long as you provide the same methods mentioned above. Put these files together with your other Marlin files. I created most of this class in a small, separate project since uploading the whole of Marlin takes quite some time. For testing it's better to have a tiny project to test with or you'll be over-caffeinated well before lunch. myCustomOled.h - In this file (can have any name) you need to implement your own version of all the methods in ultralcd.cpp. The class holds an instance of the custom screen and handles all the actual hardware. Be advised that this approach is more time consuming, but you could of course just copy the contents of "ultralcd_implementation_hitachi_HD44780.h" and modify only the things you need. Next up: printing a nice enclosure for it! This also gave me a chance to do some extra documentation around the Megatronics 2.0 electronics that I use for the printer.